While at the F-Type launch, Jaguar designer Wayne Burgess told a story that I can’t believe I’d never heard before. It has to do with former GM VP of Design Bill Mitchell, the Mako Shark concept car, and a taxidermied shark head. The story may be apocryphal, but who cares? It’s too good. It was 1963, and Bill Mitchell’s teams were working on some concept cars for future Corvettes. One of the designers, Larry Shinoda, had a great concept car in the works, based on the 1963 Sting Ray Corvette that was about to be released to the public. Unlike most concept cars that precede eventual production cars, this one came after the production car had been designed. The goal was to have something to show that get everyone excited about the new design. The issue was the car needed some sort of theme; the fundamentals of the design were established, but they needed some exciting concept to hide the fact that the car was actually prepping people for the still-secret production model. Luckily, Bill Mitchell had returned from a fishing trip vacation off the Bimini coast with an impressive souvenir: a shark’s head, from a shark caught by Mitchell on his trip. 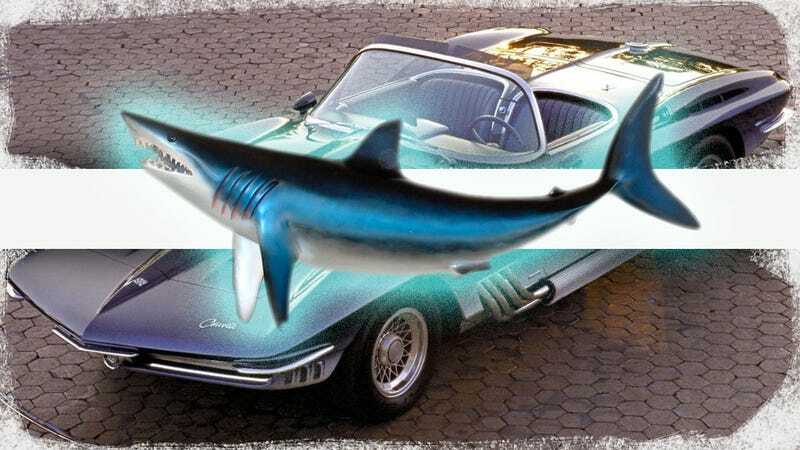 Mitchell decreed that the decapitated shark would be the source of the theme for the show car, which was to be called the Mako Shark. Mitchell was insistent that the paint job of the car exactly reflect the deep blue-to-white gradient of the real shark. Aquatic life color accuracy was a big deal in Detroit back then. So, the paint guys set to and did their best to emulate the shark’s coloring. Mitchell looked at it, and declared it not good enough. So "do it again!" he screamed at them. So they did it again, and showed it to Mitchell. Nope. Not close enough! At this point, I’m imaging Mitchell putting a cigarette out on someone’s chest. They tried again. And again. And again. Each time, Mitchell found the paint wasn’t close enough to the shark’s coloring. Finally, one unnamed stylist had a brilliant idea and gave it a try. When Mitchell came to compare the shark to the paint one more time, he was finally satisfied, much to the relief of everyone involved. So what was the final key to getting the finish of the car to match the shark? New airbrushing tactics? Early selenium-cell-based electronic color matching? Ground up shark scales from the local Asian market? They painted the damn shark.